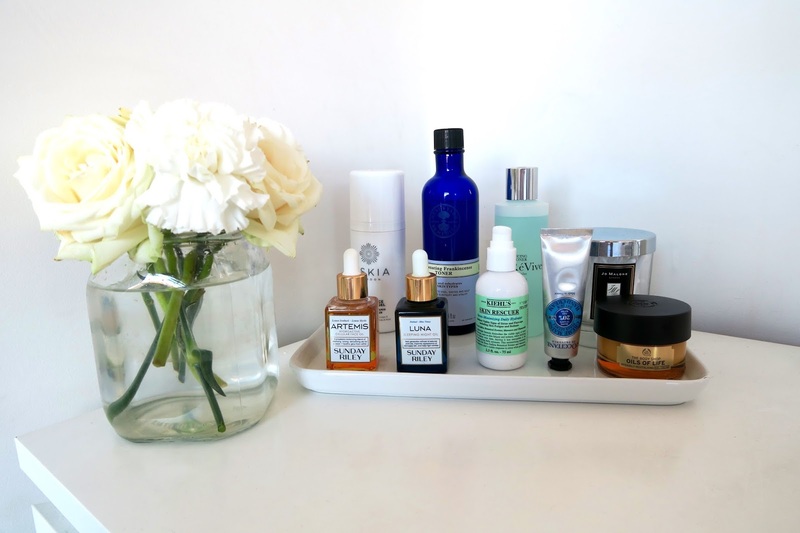 I’m not usually one who follows the whole ‘monthly favourites’ trend, but this month I’ve being loving so many certain skincare products, it would be rude not to share with you guys.. Towards the beginning of September, my skin had a little bit of a… let’s say… cardiac arrest and for some reason my good skin hormones stopped beating (wow, how metaphorical), but after using this bunch of goodies I could see a fast improvement taking away those awful blemishes and keeping my skin tone a lot more even. To start off, my ‘absolutely love love love cleanser’ Oskia Renaissance Cleansing Gel gives my face the best polish I could ask for in a skincare product. This product has been featured many times on The G Edit and for good reason. It’s balm/oil texture sinks right into the skin cleaning all the dirt gathered throughout the day, leaving it squeaky clean and fresh. With vitamin A, C, E, Omega and Pumpkin Enzymes… this is literally a skincare first aid kit in one. Simply massage onto your face then remove with a warm, wet muslin cloth. Next toning. I have loved double toning with the Neal’s Yard Rejuvenating Frankincense Toner and Re’Vive Balancing Toner, both helping to close my pores, tighten my skin and restore vitality. These have being a perfect duo and highly recommend purchasing both or either one of these. To apply, simply put a few drops onto a cotton pad and gently rub across your face and neck. 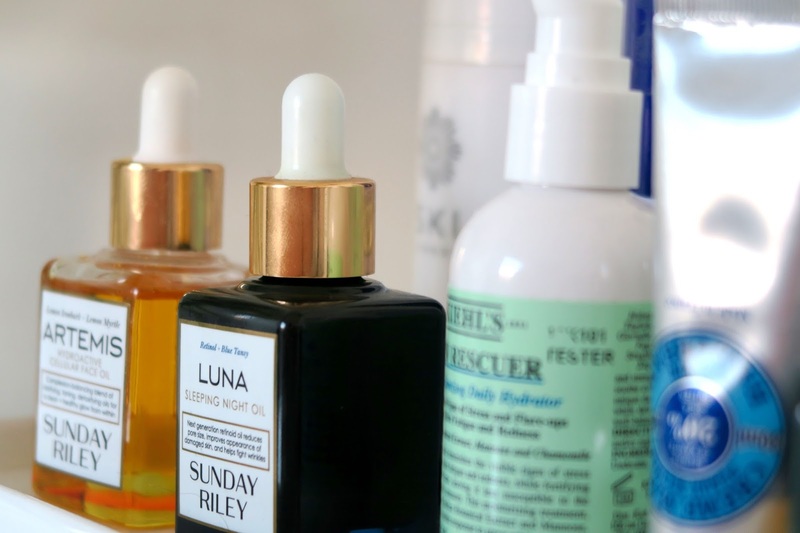 In terms of facial oils, I’ve being loving the Sunday Riley Artemis and Luna. There’s not much to say about these other than they are miracles in a bottle. For more in depth pointers about these, check out my review here. Only a few drops are needed and I tend to use the Artemis on a morning, then Luna on the evening. Perfect duo. Because it’s getting colder outside (Autumn is here people!!) I’ve being making sure my skin it tip top moisturised using the Kiehls Skin Rescuer on a morning and The Body Shop Oils Of Life Gel Cream on an evening. I love these two gel based moisturisers. The Body Shop also really inspired me with facial massages so lately when applying my moisturiser, I’ve being using different motions to give my face a gentle massage especially before bed. Finally to finish the whole routine off, I have being loving the L’Occitane Hand Cream that is the perfect size to pop in your bag to keep your hands hydrated throughout the day. 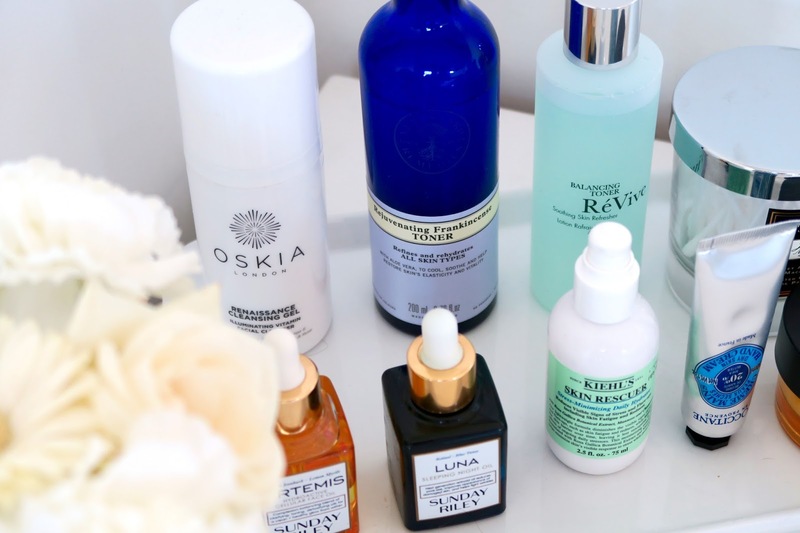 My skincare routine switches up quite often but I’ve loved these products though September and they really helped save my skin! Let me know in the comments your favourite skincare product! PS. If you want a more in depth review of any of these products, type the name in my search bar to the left and read the full review! What are your September favourites? Previous Post Edit 5 | Favorite Things About Autumn. Next Post No. 256 | Autumn Pamper Evening Essentials.